The Fortnite AR-L Nerf Elite Motorized Blaster is inspired by the blaster used in Fortnite, replicating the look and colours of the one from the popular video game! Play Fortnite in real life with this Nerf Elite blaster that features motorized dart blasting. Power up the motor with the acceleration button and pull the trigger to shoot 1 dart. It comes with a 10-dart clip and 20 Official Nerf Fortnite Elite darts, enough to fully load the clip and give you 10 backup darts for reloading. Flip up the 2 sights on the top of the blaster to align your shot. Official Nerf Darts are designed for distance, tested and approved for performance and quality, and constructed of foam with flexible, hollow tips. 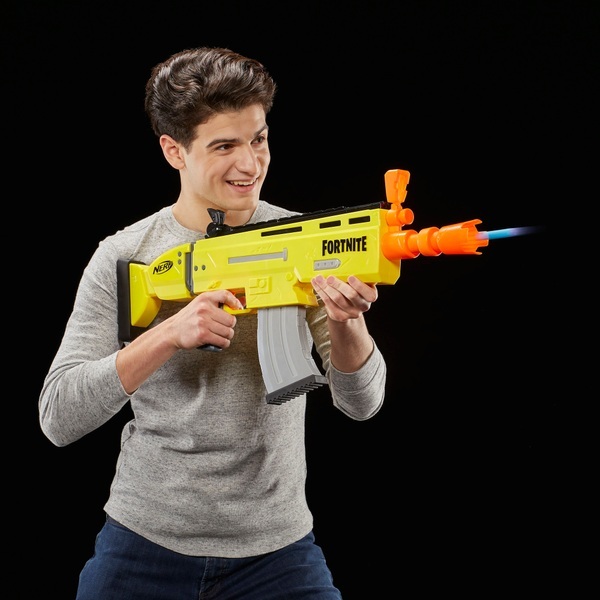 Drop into indoor and outdoor Fortnite action with this motorized, dart-firing Nerf Elite Fortnite blaster! EU Warning: Not suitable for children under the age of 3 years due to small parts which could cause a choking hazard. Do not aim at eyes or face. Use only with official NERF darts. Other darts may not meet safety standards. Do not modify darts or dart blaster.